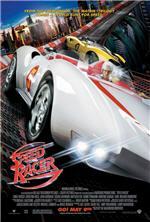 What did you think of Speed Racer? Thanks to someone who was a really big of this cartoon series, I ended up getting two crash courses in the world of Speed Racer. I know that as a child, I did see segments of the show, but I had to refresh my memory on all the mythology. Speed Racer comes from a race-car family. His parents are aptly named Mom (Susan Sarandon) and Pops (John Goodman). His older brother Rex (Scott Porter) is a big name driver himself, and as a child, Speed idolized him and wanted to be just like him and the old man. All Speed thinks about is racing cars. He lives and breathes the sport. After a falling out with his dad, Rex leaves the fold and strikes out on his own. Unfortunately, stuff really hits the fan when Rex is killed during an auto race, which has shattered Speed?s heart. All grown up, Speed (Emile Hirsch) still has a fascination with what he thinks is his destiny, as well as his long-time girlfriend, Trixie (Christina Ricci). He knows he has a legacy to continue. The biggest race of the year is coming up, and of course, he wants to win! A rival racing company led by the snarky Royalton (Roger Allam) shows an interest in Speed and wants him to sign a sponsorship contract, therefore merging the two companies. Something smells a little fishy in the ranks of racing and it?s up to the one and only Speed to crack the case! The film was shot in nothing but bright and vibrant colors. They were great for a while, but during all the racing scenes, I felt like I was watching a really long commercial for a Hot Wheels glow-in-the- dark racetrack. Remember those from the ?80s? The kind with all of the loop-de-loops and twists? Well, if you think about it, The Matrix franchise is definitely a tough act to follow, and the Wachowskis decided to not only pay homage to a classic, but give the kids something glittery and dazzling to have them beg their parents to take them to see. Hey, along with the nostalgic aspect, the fast pace and the colors attracted me to this movie. I?ll be honest! Goodman and Sarandon are up there on my list of favorite actors, even though they decided to play it safe by taking family friendly roles. Hirsch and Ricci gave it their all and did pretty well. As a mysterious figure known as Racer X, Matthew Fox has a small, but important role in the film. With a chimpanzee as his sidekick, the scene stealer and film?s clown would have to be Paulie Litt as younger brother Spritle. Go, Speed Racer, Go? No, Speed Racer, No. At least not with this film. In multiple reviews, I have made comments about certain movies that ran too long and stretched what little action and plot they had, and you can count this one among them. Did it really need to run for over two hours? No way! Despite all the eye candy, this certainly didn?t make me cheer all that hard for our hero. It?s marginal, at best. Kids, wait for it to come out on DVD.